BELIZE CITY, Thurs. 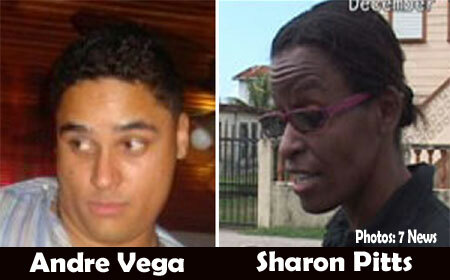 Oct. 26, 2017–In the next five days, exactly one year will have passed since the Office of the Solicitor General wrote UDP crony Sharon Pitts, and the son of disgraced Deputy Prime Minister and Minister of Lands Gaspar Vega, Andre Vega instructing them to return nearly one million dollars of taxpayers’ money ($400,000 each) they had received in a shady land transaction when the senior Vega was the Minister of Lands. However, to date, neither Pitts nor Vega has returned a cent of those monies. To add insult to injury, last December the Solicitor General filed a lawsuit in the Supreme Court against the duo, but that suit has not yet seen the light of day. According to Peyrefitte, his Ministry has done its part by filing the claim; the defense has submitted a response and now the court simply has to do its part by setting a trial date. “The court operates at its own pace,” he said. Peyrefitte further told Amandala that he was concerned with the significant delay seen not only in this matter, but in others matters currently before the courts. However, he revealed that due to the delay in delivering rulings in several matters, Chief Justice (CJ) Kenneth Benjamin has gone on a leave of absence to try to clear those backlogs. He is expected to make his return by mid-December and so in the meantime, Michelle Arana will serve as CJ. And so, according to the Attorney General, he believes that the legal battle with Pitts/Vega will spill over into the next year. When we asked what was the Government’s chances against Pitts and Vega’s legal counsels, Hubert Elrington and Estevan Perera, Peyrefitte did not say much. “I don’t want to discuss our strategies,” he said. He added that he had promised not to comment on matters presently before the courts. However, he did reveal that he felt optimistic about the government’s chances. Last year Amandala had broken the story on the land transaction involving Pitts and Vega after we had received leaked documents from the Department of Lands. The documents revealed that the duo was transferred privately-owned land at Mile 5 on the Philip Goldson Highway, near the Haulover Bridge. This transfer occurred even though the Ministry of Lands was aware that the land was already owned. The documents in our possession reveal that on at least two occasions, public officers pointed out to higher-ups in the Ministry that the said land was already privately owned, and in fact, the Lands Commissioner had given instructions to revoke Pitts’ permission to survey the land. Still, Pitts went on to receive her title and so did Gaspar Vega’s campaign manager, Hilmar Alamilla, who is now jailed on a charge of murder. However, Alamilla went on to sell his parcel to Vega’s son, Andre Vega, for $15,000. Noteworthy is that Alamilla had originally spent $2,500 for the 1.124 acres in question. In both cases, the Government of Belize then had to re-acquire these privately-owned plots of land from the two individuals at a hefty price of $400,000 each. Following this revelation, more documents surfaced of shady transactions in which the Vega family acquired thousands of acres of prime land while Gaspar Vega was the Minister of Lands.